Often people are not into the white display, so they are happy when the dark mode option is available for them. When you are referring to dark mode, then it does not have to be pure black. The twitter has just launched a night mode for its app, and it is not black but gives a blueish kind of vibe. But if you are in that squad who does not seem to like bluish tint, then you can even set the mode to pitch black. Once you made your mind to use this feature, then open the settings of the app and go to the “setting and privacy" section. There you will see "Display and Sound," and that is when you can change the light mode to dark mode. But if you don’t want the blue-ish color combo, then you can increase the dark pitches in there. The twitter did something different because they not offer white and black theme but also a third option to the user. The app does not go by the book all, and it is clear from their blue-ish theme. Dark modes are becoming a trend because they help people not only use smartphones without getting their eyes tired, but they also will be able to save more battery. 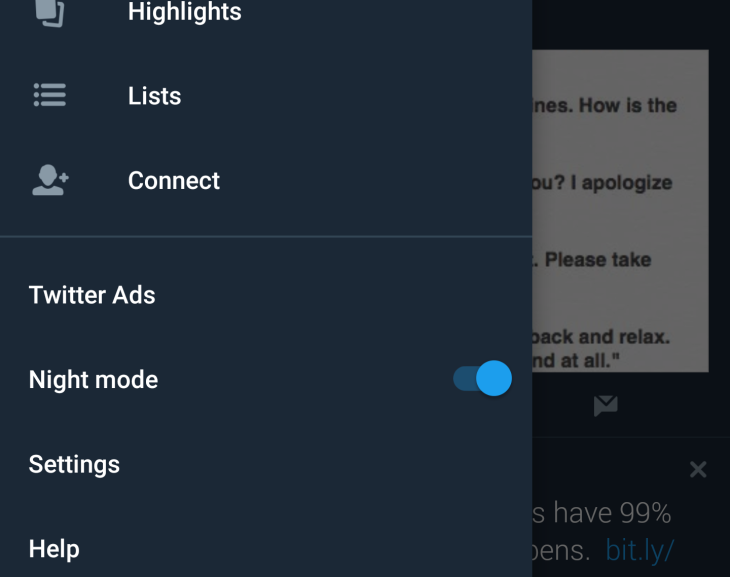 Not only Twitter a lot of different other apps such as Google, Youtube, and others give the option of the dark mode to ease the use for the people. In short, the dark mode is an excellent addition to Twitter for its users.